This CRB4S brushed silver child resistant bag is an excellent choice for single use storage of cannabis flowers, edibles or concentrates and small pharmaceuticals. 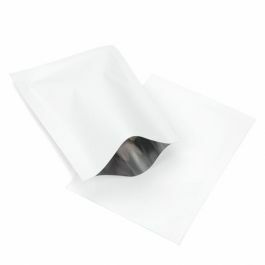 This odor proof bag measures 1 1/2" x 4" and offers discretion for packaging organic medicines and a metallized barrier to lock in smells and freshness. The CRB4S is ideal as a single serve bag for medicinal marijuana, edibles, or concentrates, as well as small pharmaceuticals. CRB4S comes in brushed silver and has outer dimensions of 1 1/2" x 4". Built-in security such as no tear notches and 5 mm side seals create the desired tamper-resistant bag to deter children from investigating contents. A high metallized barrier controls odors and restricts the transmission of moisture. 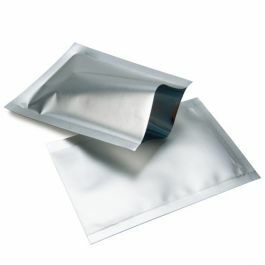 This smell proof bag can be hand sealed to provide optimal safety. The opaque metallized material ensures the inside contents are concealed from view. Outer Dimensions: 1 1/2" x 4"